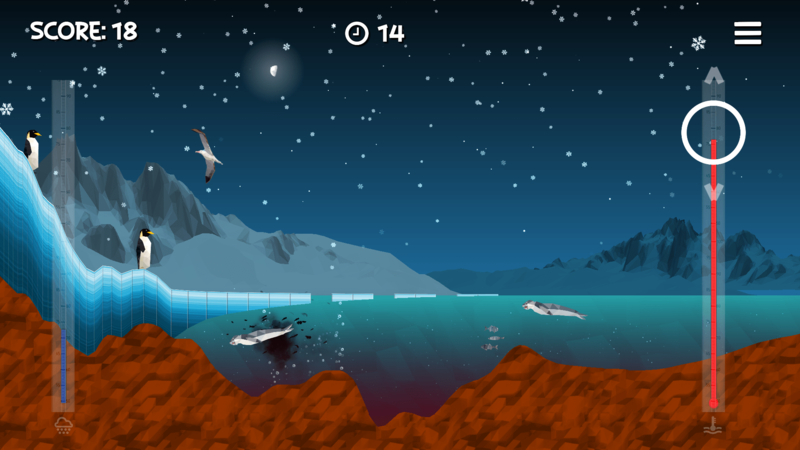 Ice Flows | News and discussion for the development of Ice Flows - an interactive computer game/app all about ice sheets in Antarctica. 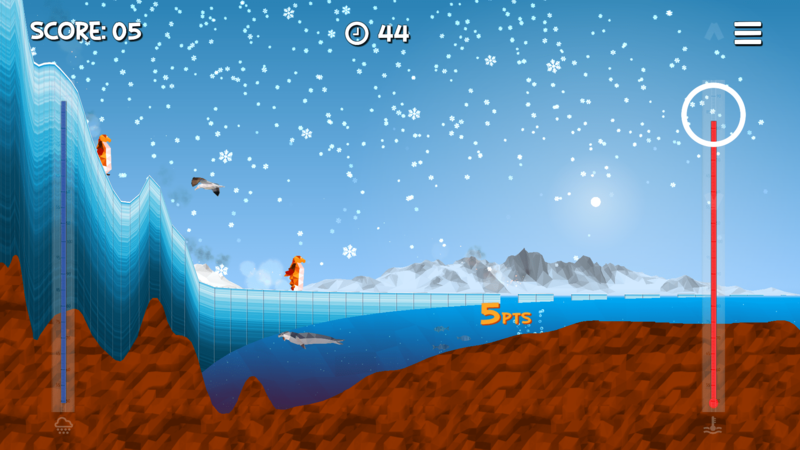 One of the reasons I was motivated to make Ice Flows was to help people understand iceberg calving (breaking off) behaviour: sometimes iceberg calving is a normal part of the life cycle of a glacier which ends in the sea – snow feeds the glacier, which is turned into ice, which is then lost further down the glacier, as melting, or as icebergs breaking off the ice front. On the other hand, sometimes an iceberg calving event is a sign that all is not well for the ice shelf. What we need to assess is whether this iceberg is just part of the life cycle of this part of the Antarctic Ice Sheet – is it just that this part of the ice shelf has been hanging on for a while, so it is bigger than your usual iceberg, or is a sign of things to come for this ice shelf, leading to a potential collapse of the ice shelf. Adrian Luckman, leading the project reported in the story, indicates that there is uncertainty over the implications of this iceberg for the future of the ice shelf. To fully assess the implications, we need to use computer models that can represent the important aspects of the ice sheet/ice shelf/ocean system, and do some experiments with these models to see what might happen after this iceberg calves. A study by Johannes Fürst published last year in Nature Climate Change1 assessed the areas of ice shelves which were important for “holding back” (buttressing) the grounded (not floating) parts of the ice sheet. The study found that most of the ice in the part of the ice shelf about to break off was “passive” ice, i.e. that if it broke off, it wouldn’t lead to a speed up of the grounded ice behind it. However, they noted that the ice shelf front would then take on a shape which was similar to that of other parts of the Larsen Ice Shelf before they collapsed. Members of the Project MIDAS team published some modelling results in the Cryosphere in 20152 (open access) which suggested the rift presents a considerable risk to the stability of the Larsen C Ice Shelf. If this iceberg calving event does lead to the collapse of the rest of the ice shelf – which is holding back the grounded ice behind it – then speed-up of the grounded ice would be likely to occur and this would then lead to sea level rise. However, if ice shelf collapse does not occur, the ice will flow forward as normal and the ice front will most likely advance again until the next calving event occurs. 1Fürst, J.J., Durand, G., Gillet-Chaulet, F., Tavard, L., Rankl, M., Braun, M. and Gagliardini, O., 2016. The safety band of Antarctic ice shelves. Nature Climate Change, 6(5), pp.479-482. 2Jansen, D., Luckman, A. J., Cook, A., Bevan, S., Kulessa, B., Hubbard, B., and Holland, P. R., 2015. Brief Communication: Newly developing rift in Larsen C Ice Shelf presents significant risk to stability, The Cryosphere, 9, 1223-1227, doi:10.5194/tc-9-1223-2015. I’ve recorded some screen capture videos for use in talks to demonstrate ice sheet behaviour. I found it hard to demonstrate and narrate at the same time when I tried using the tutorial in a presentation! Narrative: To introduce the role of snowfall and ocean temperature changes in controlling the extent of a marine ice sheet. Narrative: That icebergs are a normal part of marine ice sheet behaviour – that it is important to look at the net change in the calving front location to understand the implications of an iceberg calving event. Narrative: On a forward slope, a small change in ocean temperature causes a small change in the groundling line location. However, a small change on the threshold of a reverse slope means a large grounding line change. The level starts with the Institute Ice Stream grounding line in approximately its present position. Narrative: Demo of how increased water temperatures beneath the Filchner-Ronne Ice Shelf could cause the collapse of the ice shelf and retreat of the ice sheet. The level starts with the Institute Ice Stream grounding line in approximately its present position. Full version of Ice Flows coming soon! 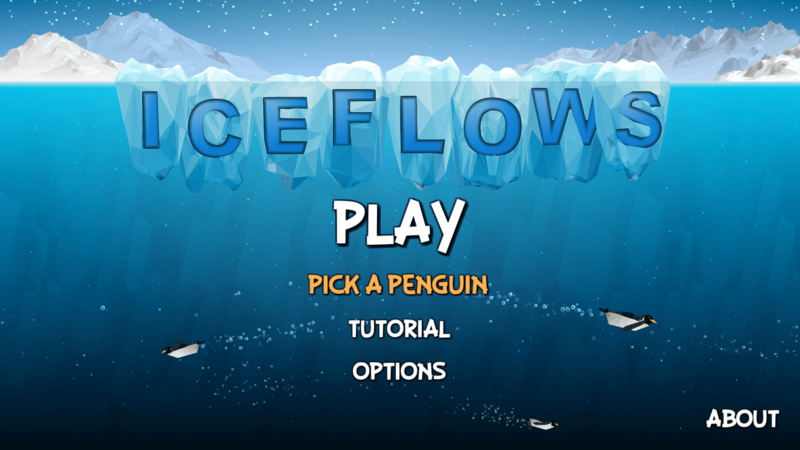 Thing have been a bit quiet on the blog since we released an Alpha test version of Ice Flows, that’s because we’ve been working hard on putting everything together for the full version. The good news is that we are very close to a finished version, we are just putting the finishing touches, making sure everything looks as it should. and here is a sneaky peak of some of the characters we’ve been working on! We will be carrying out some testing on this final version, then the plan is to release the game on the web and in the app stores at the time of the SCAR Open Science Conference in Kuala Lumpur in August. 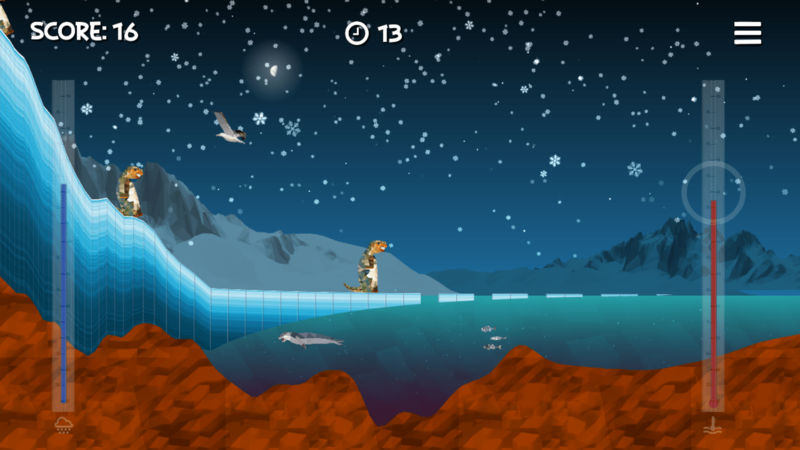 In the meantime, you can play the Alpha Test version http://blogs.exeter.ac.uk/iceflowsgame/2016/05/04/try-out-alpha-test-version/. Try out our alpha test version! We are pleased to announce that we have an “Alpha” test version of the game available here for testing and feedback. Note that “Alpha” is the test version that comes before “Beta”, the test version which comes before the final launch, so it is not a finished product! Please bear this in mind, and check out http://blogs.exeter.ac.uk/iceflowsgame/2016/04/28/alpha-version-coming-soon/ for screen shots of the game screens. Some elements of the graphics also needs polishing, so please bear with us while we are still working on these aspects. The demo is set up for the Institute Ice Stream, but the game will have different unlockable levels for different ice streams. At the moment, we are only working on Weddell Sea ice streams as the game development is being funded by a NERC grant led by Hugh Corr at BAS, looking at the ice streams draining into the Filchner Ice Shelf. The left hand slider is the input rate (snowfall) control and the right hand slider is the ocean temperature control. These may be a cloud which changes size, and a thermometer in the final version. What else will there be in the full game? 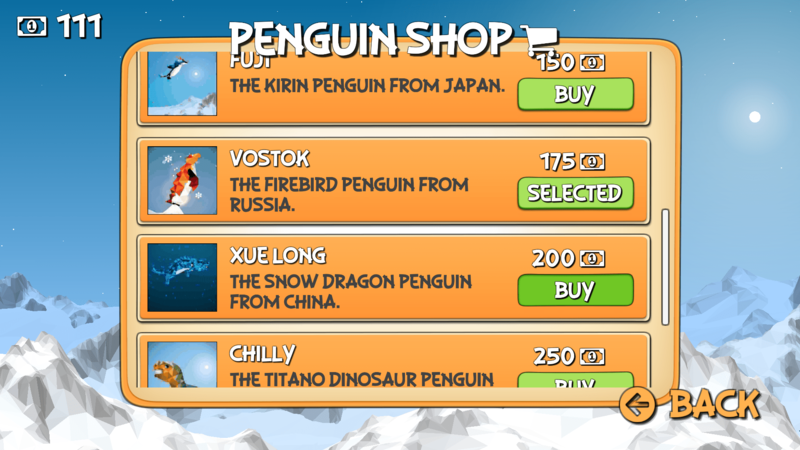 – A penguin store where you can spend your points upgrading your penguin! Leave a comment or email me to provide any feedback! The team have been busy getting Ice Flows to Alpha stage testing. 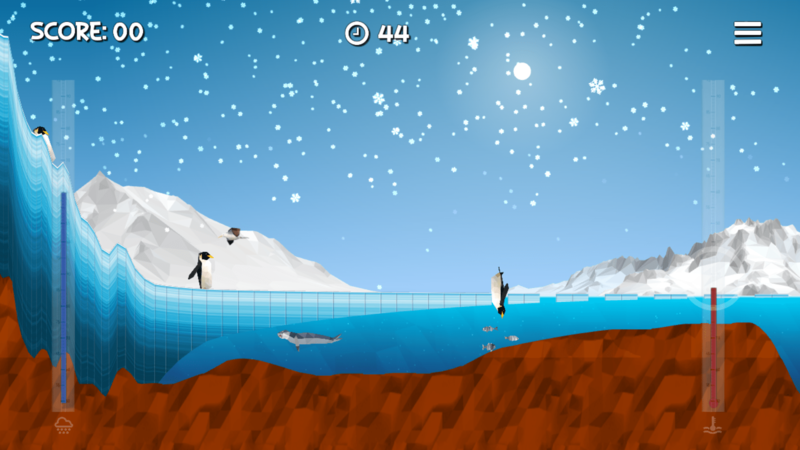 All the major components of the game are in place… The bedrock, the sea and the ice, the controls, some level progression, tutorial stages, scoring, bonus rounds and penguins. There’s a lot still to come but first we need to test this core functionality to destruction. Within the next few days we’ll be releasing some parts of the game as an open alpha and invite you all to try it out. (Data on level selection screen from BEDMAP2 (https://www.bas.ac.uk/project/bedmap-2/) and MEASURES (https://nsidc.org/data/docs/measures/nsidc0484_rignot/projects)). What do we want? Data! 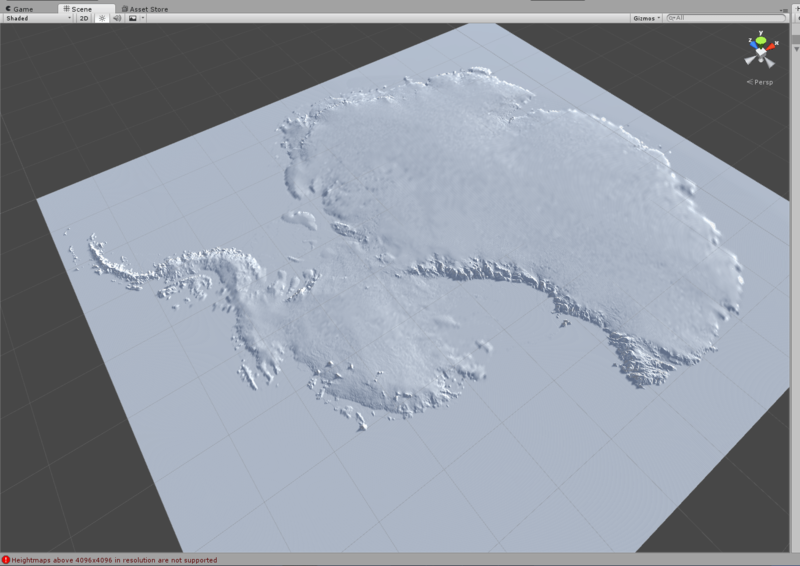 Large parts of the Antarctic have been surveyed thanks to the huge efforts of Antarctic scientists over the previous few decades… this gives us a great opportunity to use this data to inform our game world and get it into the hands (and minds) of our users and the public.